Sonic Cathedral: Laura, congratulations on Shadowrise winning one of the two Battle of the Bands slots for this year’s Female Metal Event - FemME! How did it feel when you heard “Shadowrise” named as one of the winners? Laura: I was really very happy … and very relieved, because it was also very nerve-wracking! I really hoped that we could be there. Then we heard that we actually would play there, and of course, that was very AWESOME. I think it’s a really important festival to play. For the genre, it’s a good place for what we play. So, we are very happy! Sonic Cathedral: During that Sunday at FemME, you are going to be a veeeery busy woman, since you are both modeling for Ingeborg Steenhorst’s fashion show and performing with Shadowrise shortly thereafter. Laura: You’ve probably seen the roster. We actually were supposed to be the opening band on Sunday. But because I’m also in the fashion show, need to get this makeup on for the fashion show, and will be doing a little bit of backing vocals for one song during the fashion show, so I have to be there all the time. It would be too much if Shadowrise had to play right away, because I also have this costume and put my own makeup on again, and get the other stuff for my face. So actually, I’m happy that they could manage for us to play second. So, I’ve got an hour or so, which is I think enough. Sonic Cathedral: Actually, this is your second consecutive year participating in Ingeborg’s fashion show at the Female Metal Event; is that right? Sonic Cathedral: I saw a post from early December 2015, about you finishing your outfit for the Shadowrise photo shoot. Do you personally have an interest in designing stage wear? Laura: That’s true because it’s cheaper to do it yourself, of course, so that’s one thing. <laughs> But I also really like to do it. Yeah, but I’m not really a costume designer or something. I like to make outfits, but I can’t actually sew things together. So I went to Black Planet in Vlaardingen, which is near Rotterdam. They have lots of clothes, but they also make designs if you ask for them. So, I just went there and I told them I needed a cape. They actually had those, but they made it for my length. I also wanted this kind of skirt thing that is on a belt and open in the front. So they made it for me too. What I did myself though were all the chains and studs and things that I have on it now. I put it on there myself because I wanted it to be a little bit more fantasy. All the other stuff, I got through AliExpress because it’s easy to order stuff online. I thought about how I wanted it to look, and just ordered some stuff, and put the rest together. For next time … I’m not doing that again because there are a lot of loose parts … so next time, I would like to have a costume that I can put on in one throw. Know what I mean? Sonic Cathedral: <laughs> Oh yes! Okay, you’ve got lots of studs and spikes and pokey bits on your outfit. When you are head-banging and moving around on stage, do you have to be careful so you don’t scrape yourself up? Laura: Oh, no. It’s okay because they are kind of soft. They are not that sharp, and they are not really in a place where they actually can do that. <laughs> I think my band members must be more afraid of me, than I am of myself. They are sometimes afraid because I have this staff also, and there are studs on it too. I made it myself because it’s waaaaay cheaper than having one made. Sonic Cathedral: As always seems to be the case, Shadowrise did your photo shoot in the middle of December. Of course, the guys all have long sleeved shirts and leather jackets, while you basically have a cape. How do you get through a winter photo shoot like that? Laura: It was veeeery cold. <laughs> Luckily, the sun was there, so it wasn’t very, very, very cold. Still, it was cold because the wind was blowing very hard. That was actually nice because we didn’t have fans with us, so my hair was like “whoosh”, which was kind of nice. But it was really very cold. In between the shoots, I just threw on my jacket for a while. I was glad when it was over, and I could get a hot chocolate. Sonic Cathedral: In addition to winning the FemME Battle of the Bands, congratulations are in order for your recent graduation from Metal Factory. For folks who haven’t heard of Metal Factory, would you give an overview of what it is? 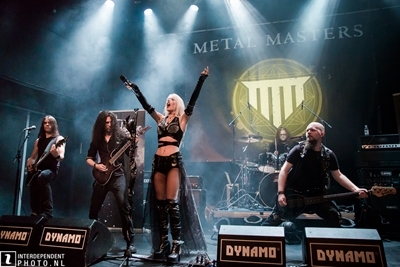 Laura: Metal Factory is actually like any other music course, but of course, it’s specialized in metal. So, you’ve got history … a little bit of normal music history like how it started to be written down, for example, in this time when most of it was done by monks and by the church. And then, they just take it further and further, and they get more into the metal part. So, you’ve got the rhythm and blues thing going on, which of course is part of the roots of metal. For example, Black Sabbath actually started with playing blues, and then began playing their own songs, and then became Black Sabbath. So, we get a whole history, and they tell us all about different kinds up genres up until now. You get everything, but really also focused on metal. It’s of course about metal (but not only metal), because you want to get a little bit of the bigger picture too. For example, when MTV was there, you get the glam metal because that was actually something that was part of the arena metal -- very big and very visual, so for TV, that was a good thing. They give you the bigger picture; they tell you everything about metal, but they tell you about rap because that’s actually the thing that influenced nu-metal. And they tell you about classical music because it influenced a lot of metal artists. That’s kind of how it goes. If you play guitar, they tell you about other genres. But it’s really nice to be able to ask Danny Tunker from Aborted … well, he is not in that band anymore … but you can imagine this very technical, fast death metal is not something you can learn in any conservatory. So, it’s very nice to have people like that walking around at school, so you can ask specifically how that genre is done. Also, all the guys teaching there are in pretty well-known bands in the Netherlands. So, it’s a really a good start if you can get taught by them and ask questions, because they’re living what you want to become. Sonic Cathedral: Fantastic! 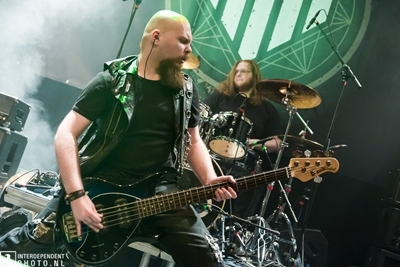 Now, Shadowrise has been around as a male-fronted band since 2009. But you joined in 2015, after meeting the guys at Metal Factory. Did I get that right? Laura: Yeah, they started in 2009. We are all now ex-Metal Factory students, but it wasn’t like that before, because they actually were all just friends and started playing metal. Now we are all like this. Sonic Cathedral: How did you come together with the guys from Shadowrise? It seems like things moved very quickly after you joined the band -- recording the Escape from Shadow Island EP, live shows, and a flurry of activity. Laura: Mmmhmmm. I joined in August . I am not sure anymore what was the exact date, but I did auditions. They sent me four songs … actually, the ones that are on EP now. I chose to audition with the most melodic ones, so “Django” and “Escape [from Shadow Island]” because those are the best for my voice. I can do a bit of grunts, but I prefer clean vocals and am now doing just the backing grunts. They liked it, and I already knew them a bit. <laughs> But I was still nervous! At the Metal Factory, we have these places where you can study with the whole band. We did auditions there, and it was okay. It was nice because I was looking for a new band, and I really liked their style. After that, it was like this because they already had the recordings planned. They were in a hurry, so I had to get the stuff in my head quickly and finish it also. Well, everything was finished, but (of course) I have a little bit of a different voice. I tried to make it more of my own, so I changed some things and I had to finish the choirs and stuff like that. Then it was really done. But it became a bit nerve-wracking when I got sick for two weeks with a fever. <laughs> It was already a bit of a busy time because, at that time, I also did this … what do you call it … ah, the fashion show, which we talked about earlier. And I was singing a song there too. Actually, with a fever, I had to finish a song that was played at the fashion show too. They actually wrote the whole song, but it was actually a little bit the same as the Shadowrise EP. They had the lyrics and the vocal lines, but I wanted to make it a little bit more of my own and a little bit different with the lyrics. Yeah, it was a little bit busy. So, I was actually finishing that fashion show song with a fever, and then prepare for recording the EP. Luckily, they could actually reschedule because, after the fashion show, therewas one recording day or maybe two, so they could pick another date for one of the recording days because I was sick at the time. I really NEEDED that because I still had to finish the other two songs [“Rise” and “Monsters”]. The two songs I did for the audition, I could record those on the day that couldn’t be changed. So, it all fell into place, but it was a bit stressful. Sonic Cathedral: Laura, how and when did you first get bitten by the metal bug? Sonic Cathedral: <laughs> That’s okay. You were only 15. Laura: Yeah, that’s true. I also listened to Linkin Park of course. I listened to a lot of stuff, but actually the CDs I bought and the bands I was really into at that moment were Within Temptation, W.A.S.P., Murderdolls, and that kind of stuff. But I was into Within Temptation the most. After that, I started listening also to power metal, like Rhapsody and Gamma Ray. There is this kind of progressive/power metal project, called Aina. I don’t know if you know it, but it’s a rock opera that I really like. I started listening to Star One from Ayreon … ah, not Ayreon, but from Arjen Anthony Lucassen also … so, I just started to discover metal. I actually felt drawn to the style that was not too hard, but to the little bit more heavy stuff, compared to the more pop rock stuff. Sonic Cathedral: Escape from Shadow Island has a strong fantasy theme running through it. Are you personally a fan of fantasy or science fiction? Laura: Yep. If I’m going to watch a movie, I’d rather watch fantasy or sci-fi than another genre. 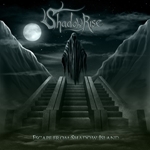 Sonic Cathedral: Is Escape from Shadow Island a concept EP, or does each track tell its own free-standing story? Laura: It is meant as a concept story, but if you read the lyrics, it’s not that clear about what is happening. You don’t see a clear story. But it is a concept album in this way: It’s all about escaping from a hard time, and you’re trying to get out of it. All the songs are about that. The only song that is maybe a little on its own is “Django”, because it’s about this one character who is going through something. But in this way, it’s a concept album. Sonic Cathedral: Shadowrise have been playing out new songs that are not on the EP. Is a new album in the works? And if so, are you likely to have a role in writing lyrics? Laura: Actually, I’m writing the lyrics now and all the vocal lines. It is still a work-in-progress. I think if we have more songs, then we’ll probably look again at what we have and if anything needs to be changed. At this moment, that is actually happening. It has not really crystallized yet, but there are some really nice songs coming up. Sonic Cathedral: It makes sense to give Escape from Shadow Island time to breathe before a new album comes along. 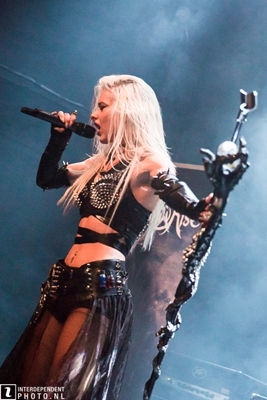 Okay, if you’re going to have a fan-girl moment at the Female Metal Event in September, which band would it be? Laura: Hmmmmm, I think it would be Ancient Bards because I really like her voice. I really like the way she sings. Sonic Cathedral: What else is coming down the line for Shadowrise? Laura: With Shadowrise, we really want to do more festivals and live shows, and we’re working on that. We are looking into the possibility to record a video clip because we think it’s important that you can actually see the band, instead of only at live shows. We really try to create this fantasy world. <laughs> We don’t really have the budget to make this whole movie-like clip, but we really would like to show more of that fantasy atmosphere. So, a clip would be a nice way to do that. We are going to see if that’s possible before autumn. We are going to try to have it around the time of FemME, or maybe a little bit later. Because we are having a summer stop now, the next gig will be the 27th of August at dB’s in Utrecht. We are going to play there for the first time again, after summer. Sonic Cathedral: Laura, before we wrap things up, would you like to give a shout-out to some of the other projects you are involved in? 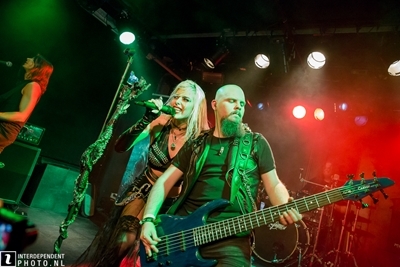 Laura: I am in two other bands, and am also doing backing vocals for Robby Valentine. I have Generation Lost. I really like that fantasy stuff, like I already said, so I started my own band. It is not going very fast, but I’m thinking to just make it a studio project. Well, it is actually going very slowly because I do want to focus on Shadowrise. But the atmosphere I want to make with the music is a little bit more sci-fi because I actually want to combine EDM, so dance music … it doesn’t really matter what kind of style … I want to combine it with some metal elements. <laughs> You have to hear it, I guess. There is nothing yet really finished. I am really taking my time with it because I don’t want to show anything to the world if it isn’t really finished. I do want to do Generation Lost with a band, but also with a producer and a DJ. So, it’s a combination of things. I would just like to do it because it would be interesting to try. Also, I have Rosewood. Rosewood I met at the Metal Factory, and that’s more rock and roll. We just write everything in the rehearsal room. It’s grunge music. It’s straightforward, but it’s still really interesting because actually there are some metal influences too because everyone plays metal. 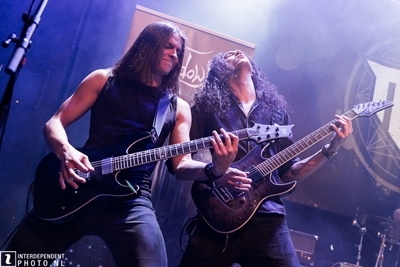 The guitarist is in a technical death metal band who plays in Rosewood; the drummer plays in a progressive metal band; the other guitarist comes a little bit from the thrash side. 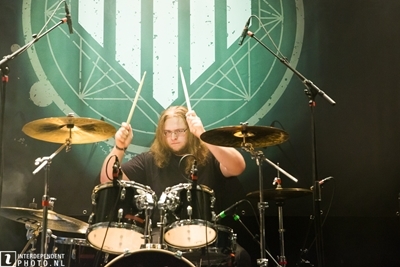 He likes a lot of thrash, like Trivium, and he plays a whole lot of Children of Bodom because he likes that stuff. Oh, and the bass player actually likes blues. So, it’s this combination of a little bit heavier kind of grunge, but it’s not really sludge or something. With Rosewood, I just leave everything to others because it would be too much. <laughs> You know, I can’t plan everything, so in that band, I just leave it up to the rest of the guys. Sonic Cathedral: Is there anything you didn’t get a chance to tell Sonic Cathedral readers, that you would like for them to know? Laura: Hmmmm, let me think about that for a minute. Oh yeah, you asked already about the FemME fashion show. There is going to be another fashion show because … I actually forgot about which anniversary, but if I’m correct, it’s the tenth anniversary of Ingeborg’s fashion label. Because of that, she is organizing this [Freak Chique] fashion show again at W2 in Den Bosch. I am going together with Micky from End of the Dream. She is in this other band [Soltras] too, and her other band will be playing an acoustic set. After the show, Lisette from Scarlet Stories will be playing a few acoustic songs with her band. I am actually going acoustic with Rosewood because I felt like that most suits acoustic music. So, I’ll be playing a little bit of acoustic stuff there. For everyone who wants to check that out, it’s going to be cool! Besides what I did for school … I have performed with Rosewood three times, all for school … it is going to be the first official gig for Rosewood. Most probably, because I don’t expect anything to happen before that time. Sonic Cathedral: Laura, thank you so much for talking with Sonic Cathedral today! Happy birthday from the whole Sonic Cathedral crew, and have a wonderful time at Wacken.